Hair transplants are often the best solution to any issues with hair loss and baldness. There are two types of the procedure includes– FUT (follicular unit transplantation) and FUE (follicular unit extraction). In the surgical process of hair transplant, this technique comes since the early days of hair plugs. However, scarring comes through this procedure as a byproduct. Each technique produces a different type of scarring on the scalp. The amount of scarring also depends on the surgeon’s skill and experience. However today due to modern technology the wound-closure techniques improved. Scarring depends on different factors such as your hair loss pattern, techniques you choose, the quality of your donor area and many other factors. Both methods of hair transplantation carry a certain type of risk of scarring but to create a natural head of hair without any obvious signs of surgical intervention it is only on the hand of a surgeon and the types of instrument they use in their clinic. The nature of this procedure a light scar will occur. Depend on the method the type of scar shows differ. In the strip method, the donor hair removal shows a line. 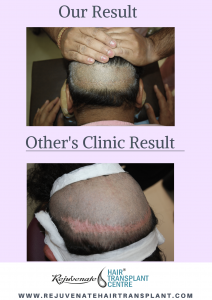 FUT creates a linear scar on the back of the head whilst the individual removal of hair follicles in an FUE procedure leaves behind multiple small dot-shaped scars. Punches must be of good quality. Size of punch must be appropriate. For Scalp, we usually use 0.9 mm punches and for beard o.75 mm punches. Over-harvesting should be avoided, otherwise, it will lead to visible scarring and thinning in the donor area. In this method, instead of making a linear incision on the back of your head, FUE involves very small round punches to separate individual follicular units (a group of one to four hairs). The surgeon then extracts the grafts, which include the hair follicle, bulb and a small amount of surrounding tissue, by hand. The round punches made on the back of your head leave small dot-shaped scars but it is easier to conceal. But the scars may still be noticeable if you shaved your head completely and these scars are seen only by looking very closely, otherwise, no one can identify the scar easily. And it cannot be seen on normal hair cutting also. In short – FUE method scarring will be almost invisible to the naked eye. FUT (Follicular Unit Transfer) procedure differs from the FUE procedure as a strip of tissue containing hair is removed from the back of the scalp. This strip is then cut into smaller individual follicles before transplanting them into the areas being treated. Because of the excision of a long strip from the back of scalp suturing is required and a linear scar will be formed. Normally it is hidden in the long hairs of an occipital area but will be visible if shaving is done. Reducing the Hair Transplant Scar Possible? 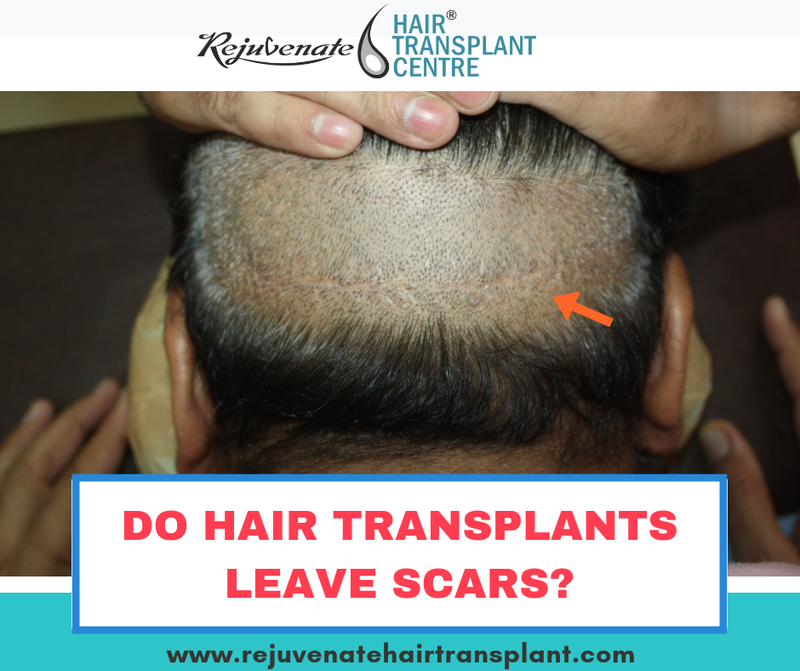 During hair transplantation when your hair surgeon meticulously closes the edges of a donor wound during FUT treatment, they generally end up with a fine, linear scar that is approximately 1‐2mm in width. Sometimes maybe the scar can be a bit wider after treatment and happens especially if the patient’s connective tissue is very weak, or the edges of the scar are closed too roughly or have too much tension. “Trichophytic” closure is a revolutionary closing technique which allows the surgeon to improve or optimize the linear scar during FUT treatment on the scalp. This approach enables the hair to grow over the scarred area. However, it cannot makes the appearance totally scar free. The objective of this “Trichophytic” closure technique helps to grow the hair and drastically reduce the visibility of the scar on the head. This method has proven to be the most effective solution for FUT scar, which has also given the best results to all the patients. If you don’t want any kind of visible scar then you can choose the follicular unit extraction (FUE) method. Though it may be pricier than Follicular Unit Transplantation, or any other traditional method, it prevents visible scarring. So before hair transplantation consult with your hair surgeon and get the transplant done for a natural look.